A majority of people tend to become more sedentary as they get on in years. This happens for many different reasons, including pain, weight, health, and fear of falling. Some people believe that exercise simply isn’t for them. However, exercise actually becomes more and more important the older you get. It not only can boost your energy; it also defends your heart, protects your independence, and can help you manage pain and weight challenges. Even better, it can help your memory, mood, and mind. Though most of these benefits are well-known, many people resist exercising as they age. 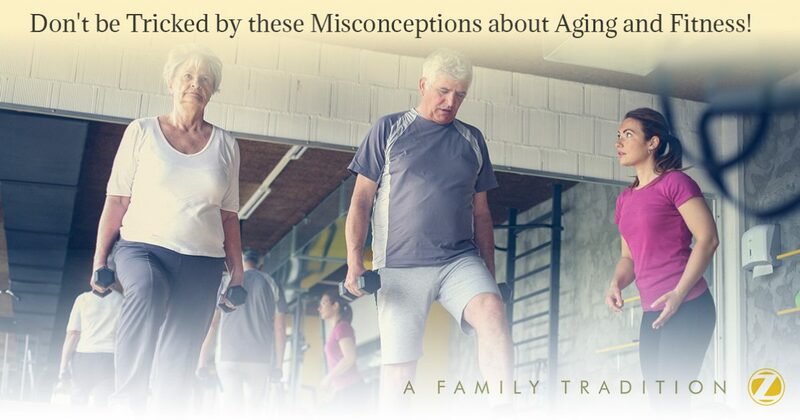 Most of them get snagged on the misconceptions we’re going to discuss in today’s blog. Did you know that adults who become active later in life actually experience greater mental and physical improvements than people who start at a younger age? 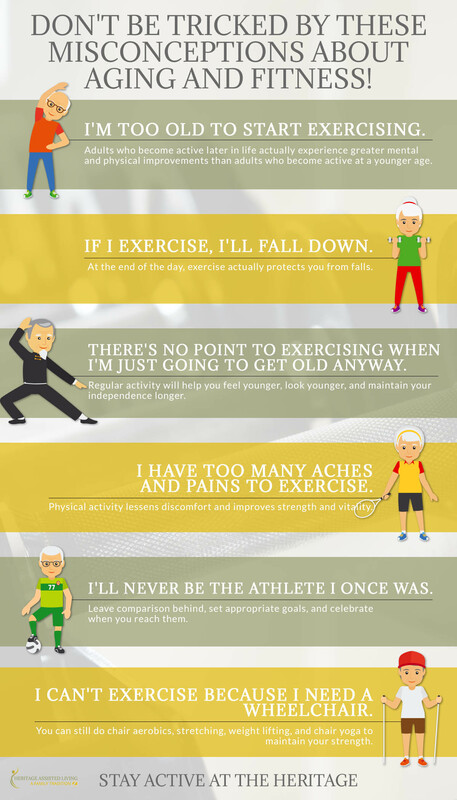 If you start exercising when you’re older, you don’t have to worry about past sports injuries. You simply won’t have as many miles on you, which means you can reap the rewards of activity sooner than others. If I exercise, I’ll fall down. If you exercise in a dangerous way, then yes, you may fall down. However, there are dozens of safe ways to get moving, and once you do, you’ll strengthen your muscles and protect your bone mass. At the end of the day, all of these benefits actually protect you from falls. There’s no point to exercising when I’m just going to get old anyway. Sure, getting old may not be the most fun thing on the planet, but you have control over your experience. Regular activity will help you feel younger, look younger, and maintain your independence longer. It will push back heart disease, obesity, Alzheimer’s, and dementia, all while lifting your mood. There is no downside to getting older and staying active. I have too many aches and pains to exercise. It is common to struggle with aches and pain as your body ages. However, slowing down will make them sharper while undermining your confidence. Many people who are getting older find that physical activity lessens their discomfort and improves their strength and vitality. You simply need to start out gently and go from there. I’ll never be the athlete I once was, and I don’t want to deal with the frustration. If you’ve enjoyed being active in your younger years, it can be painful to experience changes in muscle mass, metabolism, and hormones that cause your performance to decline. However, your sense of achievement does not have to disappear. Instead, you need to leave comparison behind, set appropriate goals, and celebrate when you reach them. I can’t exercise because I need a wheelchair. If you’re in a wheelchair, you definitely face unique challenges. However, you can still do chair aerobics, stretching, weight lifting, and chair yoga to maintain your strength, range of motion, and cardiovascular health. Again, the key is setting appropriate goals and enjoying the journey to achieve them. Our community deeply values physical activity, and we show that by providing many opportunities to get moving. We invite you to visit our senior living apartments in Hammonton and discover why we’re a great fit for you!